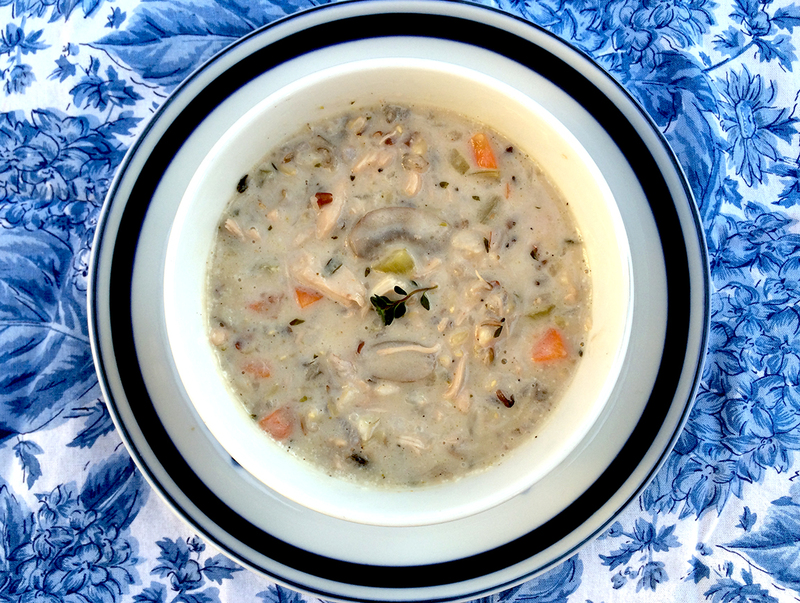 Chicken, Wild Rice and Mushroom Soup…just what the doctor ordered! I’m baaaaack!!! I hope all of you had really lovely holidays and that 2015 has been a great year for you so far! I apologize for the radio silence for so long, as even with taking some time off for the holidays, I certainly didn’t intend to stop posting for so long. It appears I became a bit run down by the time Christmas was around the corner and I managed to contract one bug after another. I’m now finishing up my third cold/flu/stomach thingy in as many weeks. I know it’s been going around, but for someone who rarely gets sick, I think I’ve had more than my fair share! Definitely not what I had in mind in ringing in a new year. My heartfelt thanks to you all for hanging in here with me in spite of my lack of posting. I assure you that I’m more than ready to get back to my regular programming. 5 degrees F on Monday, 63 degrees F and torrential rains and flooding on Saturday. What a difference a week can make! Time for something to chase away the damp dreariness of the day, and soup always makes me happy. One of my most favorite vegetable dishes, usually made during the holidays, is a potato, leek and fennel gratin. I made it this year for Christmas dinner, was going to share it with you and then promptly forgot to take the final photo before we devoured it! I can, however, point you to the recipe here, and trust me it is well worth the effort to make. And because those flavors were still so fresh in my memory, and I happened to have lots of potatoes on hand, I decided to make the gratin into a soup. 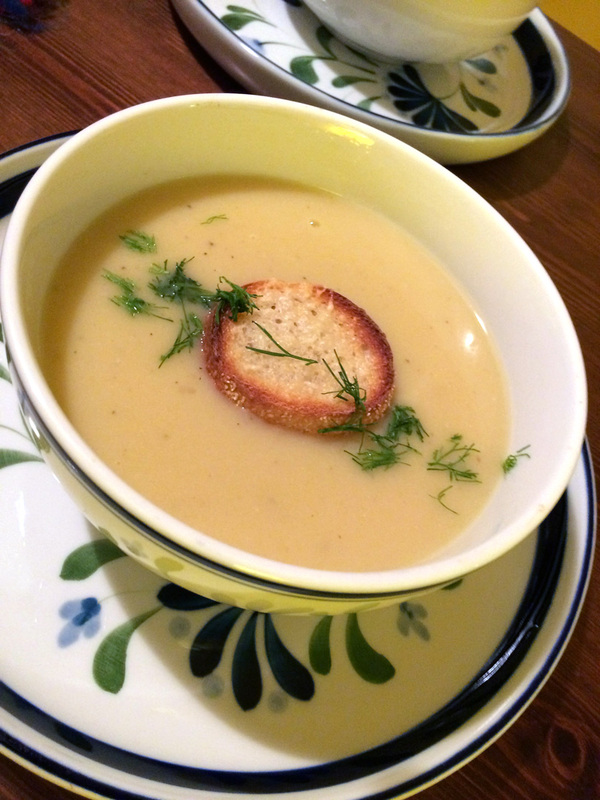 Much like a vichyssoise, this soup starts with the potato and leeks as its base, but has a mild anise flavor, a sweetness and richness from the addition of fennel. The three vegetables marry into something quite extraordinary, and a touch of cream adds a velvety and satisfying finish to the soup. I decided the best way to incorporate the parmesan from the gratin was in the form of a crouton floating on top and sprinkled with fennel fronds. Delicious soup, warm or cold. There’s more rain in the forecast for Monday…maybe it’s time for a Raindog, too! 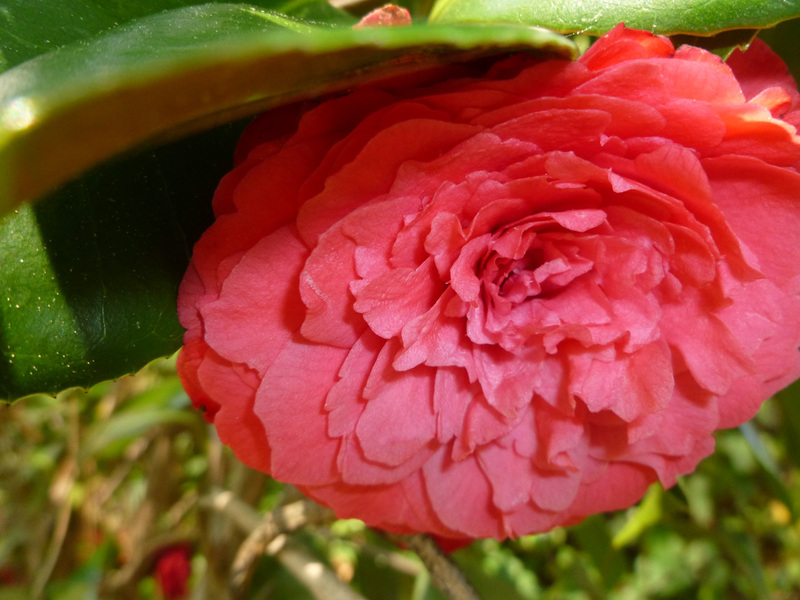 Not just for a rainy day, it’s great for any day of the year! Melt the butter in a large soup pot over medium low heat. Add the leeks and cook until tender, stirring occasionally, about 10 minutes. Add the chicken stock, fennel, potatoes and 1 teaspoon of the salt, stir well and bring to a boil. Reduce the heat to simmer, cover and allow the soup to cook until all of the vegetables are very tender, about 40 minutes. While the soup cooks, arrange the sliced baguette on a cookie sheet and turn the oven onto broil. Lightly toast one side of the baguettes, watching carefully…do not burn! Remove the baguette slices from the oven, turn them over and sprinkle each one with some of the Parmesan cheese, dividing evenly. Return the pan to the broiler and toast until golden brown. Remove from oven and set aside. Chop the fennel fronds and set aside. When the vegetables in the soup are tender, remove it from the heat and blend it in the pot until it is very smooth using an immersion stick blender, or you can blend in a traditional blender in batches and return the soup to the pot. It’s hot, so be careful. Put the soup back on the stove on low heat, add the 1 cup of cream, 1 to 1 1/2 (to taste depending on how salty your broth was) additional teaspoons of salt and the black pepper, and stir until smooth. Heat until just heated through. 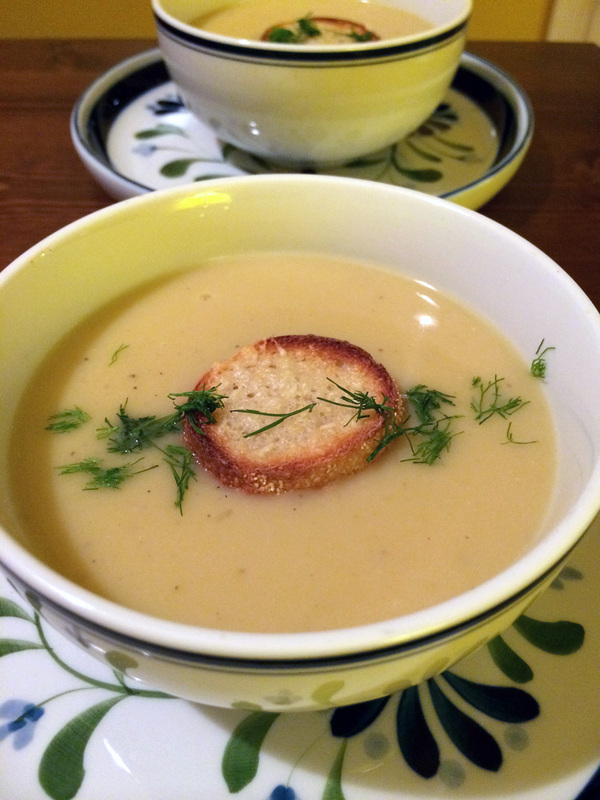 Ladle the soup into bowls and top each with a crouton and a sprinkle of fennel fronds. Serve remaining croutons on the side. 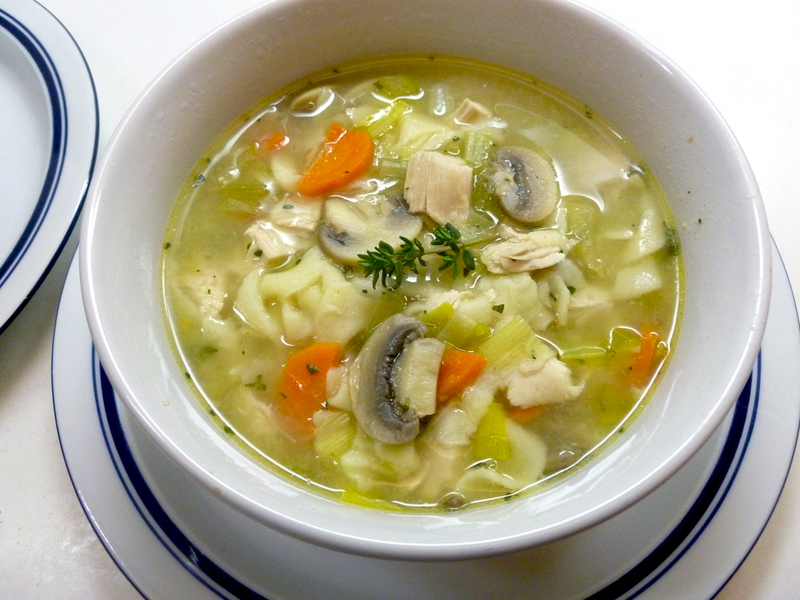 As stated previously, this soup is good served hot or cold and on rainy days or sunny days. On a whim, husband and I decided to take a day trip to the mountains last Saturday for some much needed R&R and a romantic picnic. We hadn’t taken a day for just the two of us to get away and relax since, well, you know the story. This was a restoration of the soul! And though I think the leaves had just peaked, it was a stunning day in the the North Georgia Mountains, and a day filled with contrasts. There was still lots of beautiful color, and our day started off sunny and in the low 60’s with a gentle cool breeze blowing. You’ve seen my posts before on Wolf Mountain Vineyards and Lake Winfield Scott…both located within a 40 mile or so radius of the Dahlonega area of North Georgia. We started off with a stop at Wolf Mountain Vineyards, then headed to Lake Winfield Scott for our picnic, where we had last been on a lazy summer day in early June. Imagine our surprise as a huge and unpredicted cloud came up, the temperature dropped about 15 to 20 degrees, and it started sleeting on us! We ran back to the car, and headed to Frogtown Cellars, another North Georgia vineyard, about 15 miles away. By the time we arrived there it was sunny again and a bit cooler. Such is the Fall climate of the southern Appalachian mountains! Our last stop was in the little town of Dahlonega itself, sweet but a little touristy. We are blessed to be so close to the mountains that one can do all of this easily in a day trip—even this time of year when the days are shorter—and be back home in the city just in time to enjoy a warming, hearty and rich chowder for dinner to take the chill off. At this point it looks like it’s all cabbage! But in the end it becomes a luscious and creamy chowder. 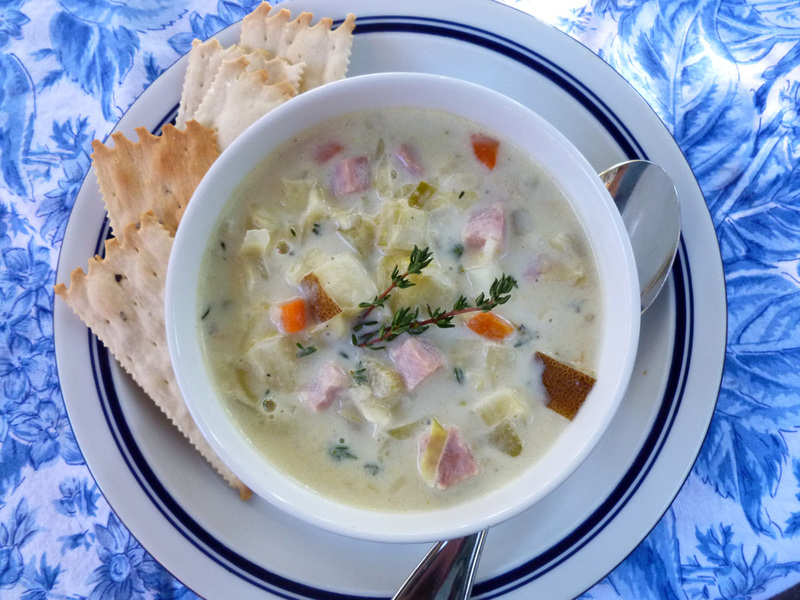 The chowder was inspired by a soup that my mom served us on our last visit to see her—a creamy cabbage soup. To be honest, cooked cabbage isn’t one of my most favorite things and the idea of a creamed soup with cabbage doesn’t get my juices flowing, so I was a bit skeptical about this soup until I tasted it…and it was absolutely delicious! It featured lovely chunks of ham, cabbage and other vegetables in a rich cream broth. I procured the recipe from Mom and brought it home…and then promptly lost it somewhere in the house! But I could remember the tastes—the cabbage and ham of course, plus thyme and maybe onion, some celery and carrot. I headed for the store, decided that leeks and potatoes would be a good addition and headed home. This “chowder” is my result. I did later find the recipe for the soup, but am quite pleased with my version which is thicker and even heartier with the added potatoes than the original was, and reminds me of a chowder and hence its name. Thanks for the inspiration, Mom! We’ve decided this is a new favorite and I will be making it again this winter for sure. It freezes well, too, which is always a bonus. Absolutely delicious. You really have to taste it to believe just how good it is! In a large soup pot, heat the olive oil over medium heat and add the leeks, celery and carrot, 1 teaspoon of the kosher salt and a few grinds of black pepper. Sauté the vegetables until they are just tender, about 5 minutes, then add the chicken broth, cabbage and potato to the pot. Bring the vegetables and stock to a boil, then reduce the heat to a low simmer, cover and cook until the potatoes are done, about 20 minutes, stirring occasionally. While the vegetables are cooking, melt the 3 tablespoons of butter over low heat in a large saucepan or skillet with deep sides. Add the 3 tablespoons of flour and stir until well blended and no lumps remain, about 1 minute. Slowly add the milk and cream to the butter and flour mixture stirring constantly until well blended, then cook the mixture over low heat until it is thickened. When the potatoes are done in the vegetable mixture, add the thickened cream sauce to the large soup pot and stir to combine. Add the ham, the remaining 1 teaspoon of the kosher salt, black pepper and thyme, and stir well to combine. Allow everything to heat through and meld together, about 3-5 minutes more on low heat, taste and adjust salt and pepper if needed, then serve in bowls, garnishing with additional thyme sprigs, if desired. 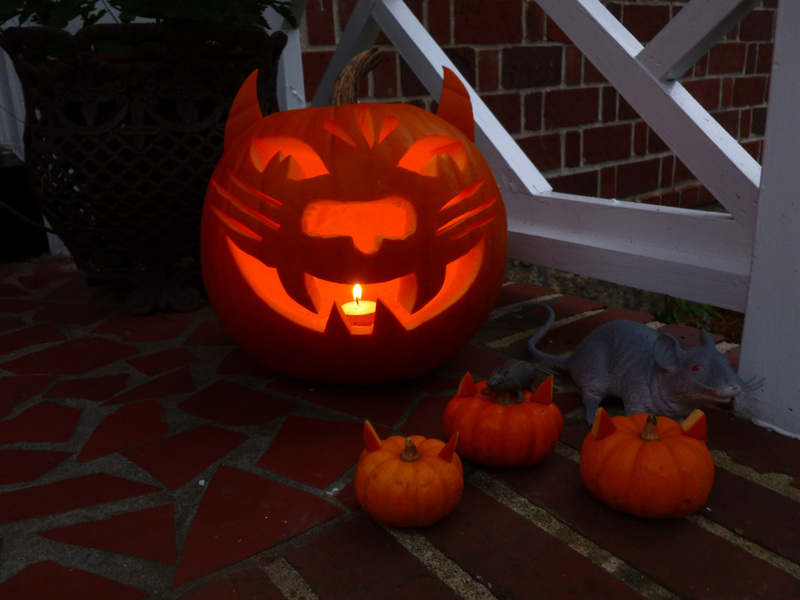 Our Halloween “Punkitty” and the two kitties that inspire are below! Cinderella really wants to greet the trick or treaters. Thumbelina really wants them to go away! My mind’s eye gazes toward a distant land and I can hear the waves of the sea, lapping against the shore in the sultry heat of the day. Just up the beach, there’s a market full of people. Even at this distance, I’m assaulted by the joyful noise of their excitement, mingling with the jumble of exotic smells emanating from row upon row of strange and beautiful spices, nuts, roots and produce. As I enter the market and take my first look, I’m astounded by the colors! Surely the full spectrum of the rainbow is represented in this place. I walk past warm and golden yellows, mellow ochres and bright oranges. A few steps further are blueish purples and rosy reds contrasting with the greens of edibles from land and sea. Then a startling array of pinks and salmons alongside the browns…from the palest of tans and reddish mahogany, to the deepest, darkest, burnt umber. The bounty and variety of ingredients is seemingly endless. I jostle my way past the crowd, eyeing the smooth, cool fruits and round and rooted vegetables. Berries of every kind are displayed in one stall, and in the next are the wrinkled shells of nuts, some deeply textured barks used for spices, and a multitude of seed pods. I make my way to the fresh and dried legumes which share space with bright, shiny peppers of every shape and size and an abundance of fragrant, fresh herbs. My imagination runs wild and my senses are fully engaged…engulfed in a world of sight, smell and taste as I think of the many dishes you could create from ingredients such as these. And that, my friends, is what curry does to me. The mere thought or smell of it has the power to transport me to another place and time—to open my mind to possibilities and experiences, and then bring me back again to the potential of the deliciousness in my grocery basket or the food my plate! Is it love? Why yes, I believe it is. In a dish, curry can enhance other ingredients and assert itself at the same time. I love it in everything from an American Southern rendition of a chicken salad, to Thai and Indian preparations. It’s also fabulous very simply swirled with a little mayo as a quickly made, but complex tasting, dipping sauce for fresh asparagus, artichokes or other veggies. If you haven’t already figured this out, it’s my favorite spice combination and I could eat it any way you can think of to use it! 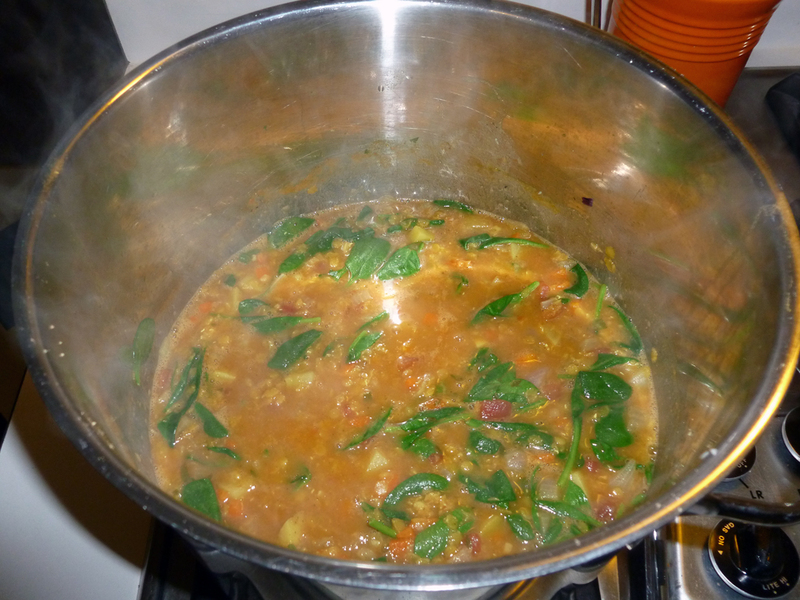 This week, I used it in a simple and hearty stew to take the wet chill away. Starting with some pretty salmon-pink colored, dried and organic lentils, and inspired by thoughts of Indian Dal and Masala Dosa, this rich stew came to life—a complete meal unto itself. It’s something to warm and awaken your taste buds, something to make you happy and nourish the soul…and something that I used to transport myself out of my stuffed-up head (I have a cold) and send me back on my way to wellness. Yes, I feel MUCH better already! Heat a large stock pot or dutch oven over medium heat and add the oil to the pan. Add the onion, carrot, garlic and ginger and cook, stirring frequently, until the vegetables are softened, about 5-7 minutes. Add the curry, cayenne pepper, a pinch of kosher salt and some freshly ground black pepper to vegetables and cook, stirring constantly, for 1 minute. Add the chicken stock or broth, water, 1 Tablespoon of the cilantro leaves, tomatoes with juice, potatoes and lentils, and bring to a boil. Reduce the heat to simmer and lightly cover, leaving an opening for steam to escape. Cook until the lentils and potatoes are done, about 20-25 minutes. Remove the lid and stir in the spinach and the remaining cilantro, allowing the spinach to wilt. Season to taste with kosher salt and freshly ground black pepper. 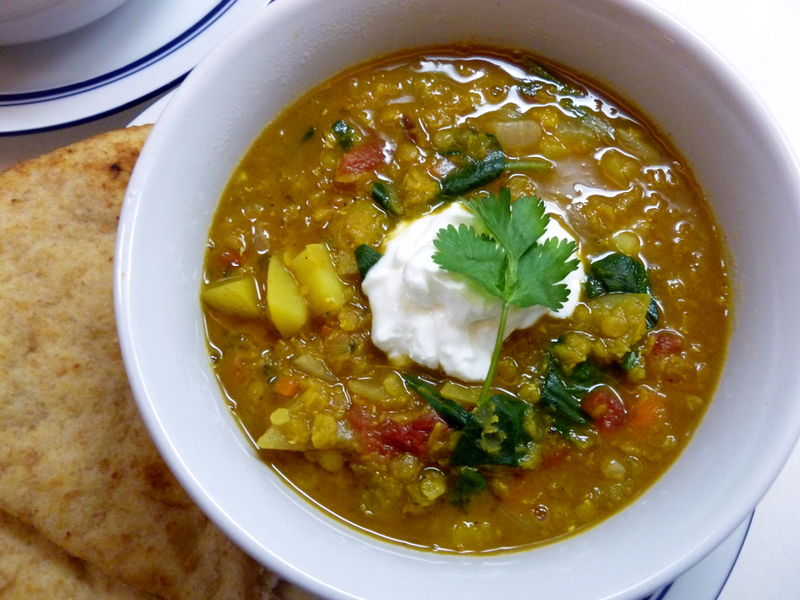 Serve in bowls and garnish with a dollop of yogurt and a sprinkle of chopped cilantro. With your first bite, close your eyes and see where it transports you! Naan served alongside this stew is very good. Rustic Roasted Potato, Broccoli and Corn Chowda! While our neighbors to the north are digging through snow, we’ve had warmer temps and rain, rain and more rain down here in the South. Not that I’m complaining because it’s so good for the garden. However, there’s enough of a chill in the air to make you want something warming and comforting for dinner…wintery comfort food, in other words. Not much to harvest in the broccoli and chives category, but still nice to have something from the garden this time of year. 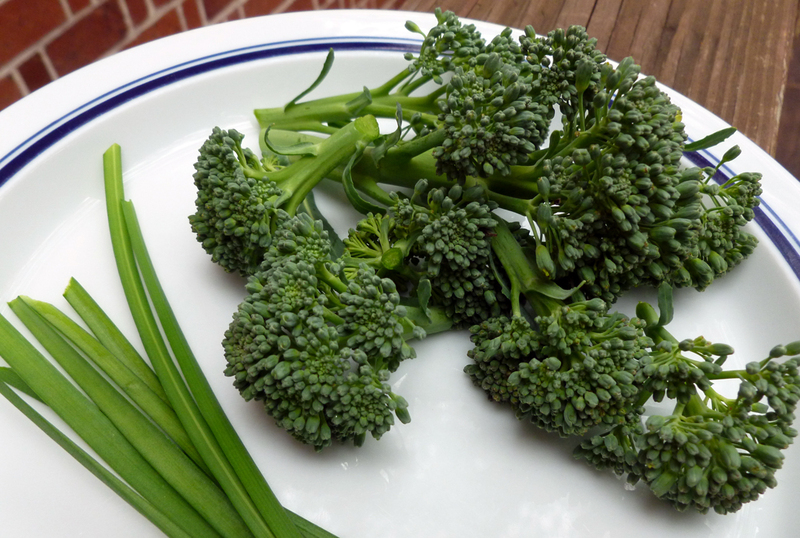 The broccoli harvest from my little winter garden was almost laughable, it was so small. There are still some babies on the stalks so I may see more before it’s all said and done, but for the time being…about 3 or 4 bites worth! 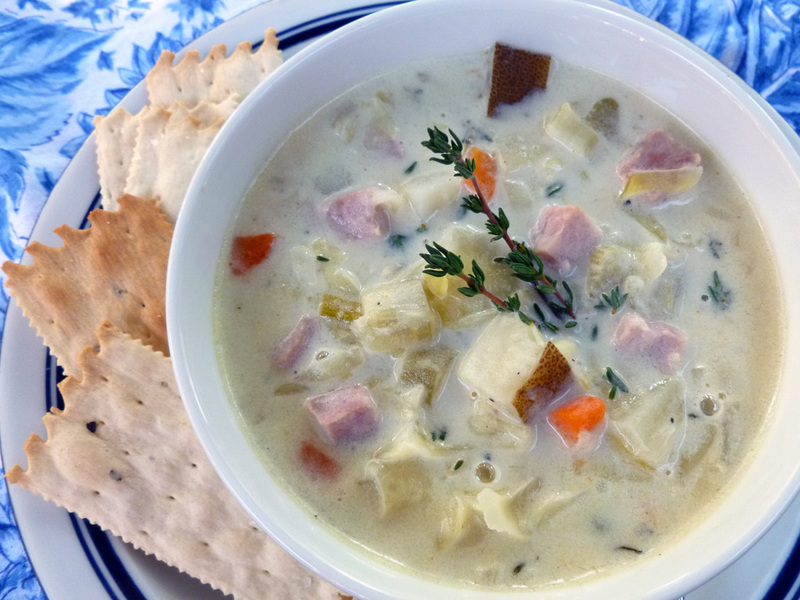 I wanted to combo it with something where we both could enjoy its flavor, even if there wasn’t enough for a side dish, and that’s how I came up with this lovely chowder. It’s rich without being too heavy, and you can easily omit the bacon for a vegetarian option, if you want or need to do so. You just can’t go wrong with anything that combines roasted potatoes, broccoli, sweet corn, onions, and a creamy base topped with a little sprinkle of bacon for good measure. You just can’t! 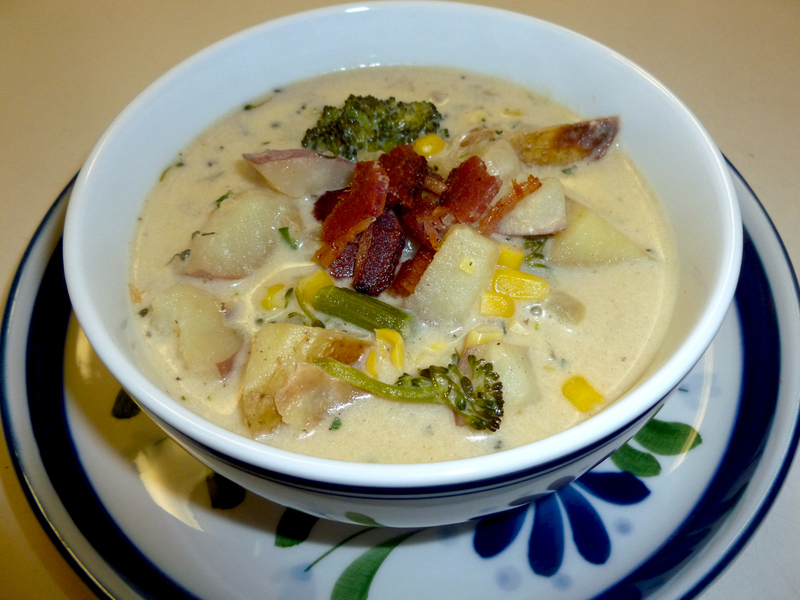 Roasting the potatoes and broccoli adds a ton of depth and flavor to this chowder. Leaving the skins on the potatoes adds a rustic touch! Cover a cookie sheet in foil and grease it with a little olive oil. Preheat the oven to 375 degrees F. Place the cut potatoes on the foil and toss them with the 1 tablespoon of olive oil, some kosher salt and pepper and 1 tablespoon of the thyme. Roast them in the oven for about 15 minutes, then give them a stir, then roast them for about 8 more minutes, or until the potatoes are starting to become tender when pricked with a fork and beginning to brown. 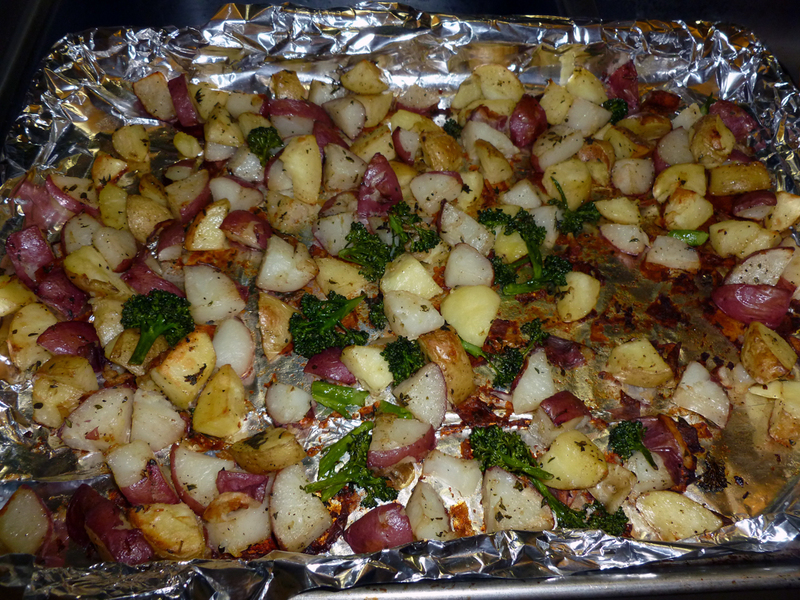 Toss the broccoli florets in 1 teaspoon of oil and add them to the potatoes, then roast another 6-8 minutes. Remove from the oven and set aside. While the potatoes and broccoli are roasting, melt the butter in the bottom of a dutch oven over medium heat. Add the onion and cook until it’s translucent, about 5 minutes. Add the flour to the butter and onion and cook the flour, stirring constantly, for about a minute or two, then add the milk slowly, stirring, then the cream, chicken stock and corn. Add the roasted potatoes and broccoli to the pot, then the chives, remaining thyme, cayenne pepper and salt, and bring to a simmer. Allow the chowder to cook for about 10 minutes, stirring occasionally. Taste for seasoning, adding a few grinds of black pepper. Serve hot in bowls and crumble 1/2 slice of bacon on top of each serving, if desired. Mmmm, mmm, good! I don’t know about you, but a bowl of soup and some good bread always says “come hither” to me. Feeling a little pressed for time lately? I know I feel this way a lot, and when I do, it’s hard to face cooking a big meal at night. I try to make some foods on the weekend that will carry us through a few hectic weekdays. But sometimes the weekends are hectic, too, and you find yourself facing that ever challenging dinner question: What to make? This week, it was veggies to the rescue! Roasting vegetables is truly a wonderful way to enjoy them, and an easy way to cook them. It amplifies their natural flavor and caramelizes all the sugars, which makes them even tastier than most other simple preparations. Once roasted, you can eat them “as is,” add them to eggs to make a frittata, use them as a side dish to your favorite meat, toss them with some pasta or rice for a vegetarian main dish, or put them on top of salad greens with a light vinaigrette. Or, as I decided to do the other night, you can make them into an easy, delicious and immensely satisfying vegetable soup, which will be all the better because of the depth of flavor from the roasting. Soup is definitely my go-to meal in the cooler months and I never get tired of it. And with a roasted veggie soup, there are so many vegetables to choose from to make this soup your own. You can mix and match as you please, but as a very general starting point, most root vegetables like potatoes, sweet potatoes, onions, carrots, parsnips, beets, etc. play well together, and the lighter, vine-ripened vegetables like tomatoes, squashes, peppers and eggplant are good partners. 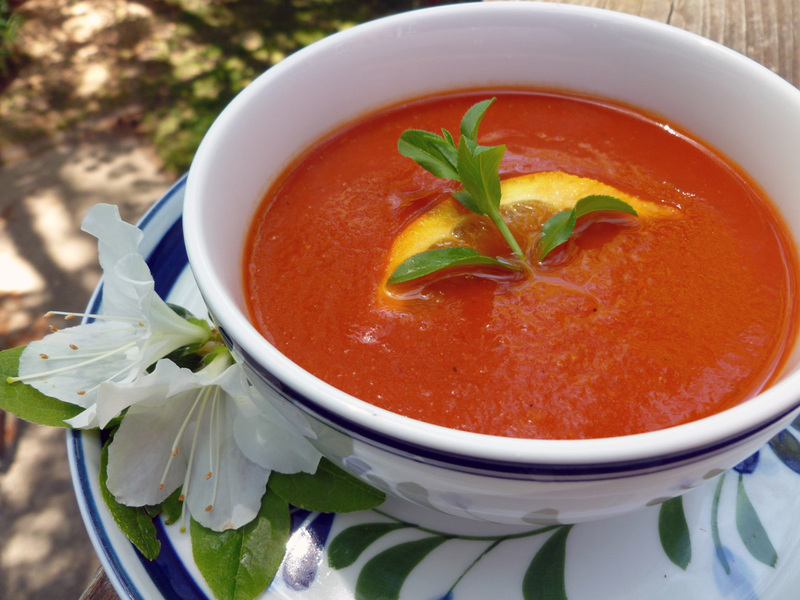 For this soup—a great way to use up vegetables by the way—I chose some vine-ripened veggies which are still available locally grown, and added some Mediterranean flavors. I already had two slicing tomatoes left over from a CSA box, and some cherry tomatoes and lots of fresh herbs from my garden. I found yellow summer squash, zucchini and sweet bell peppers in the market, and I always have garlic and onions on hand. All I had to do was a tiny bit of prep and then throw the lot into a roasting pan, sprinkle on some olive oil, salt, pepper and fresh rosemary, and roast the veg in the oven. When the veggies were ready, I transferred the contents of my pan into a stock pot, added some chicken broth, water, fresh herbs and seasoning, and cooked that for a little while until the flavors infused the broth. Then out came the stick blender and I pureed the whole thing in the pot to blend all that goodness together, and hurrah! I had an amazing, delicious soup, filled with roasted flavor and savory goodness. A soup I think even a kid could love, especially because they need never know what veggies are actually in it! Easy, yes? And it made enough to have for several nights, to boot. Perfection. 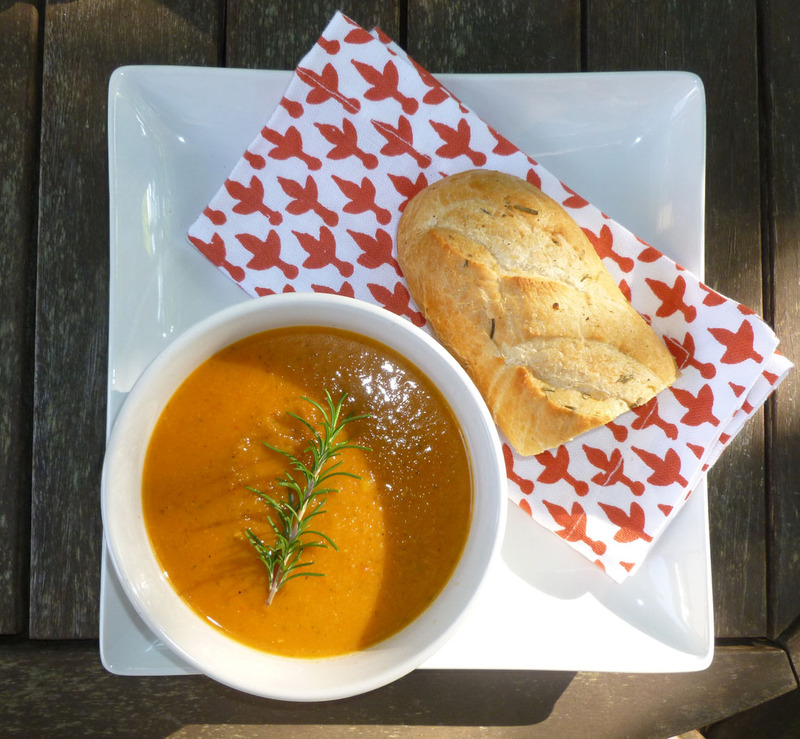 In fact this simple, healthy and quite low calorie soup was so good, it’s got me thinking about making more easy roasted veggie soups and dishes to share with you this fall, so stay tuned…this may quickly become a series! If you like the idea of roasting vegetables and soup, I hope you’ll give this one a try, or maybe a version with your own favorite veggie mix. After all, I haven’t even mentioned roasted broccoli or cauliflower, but that may be next up! 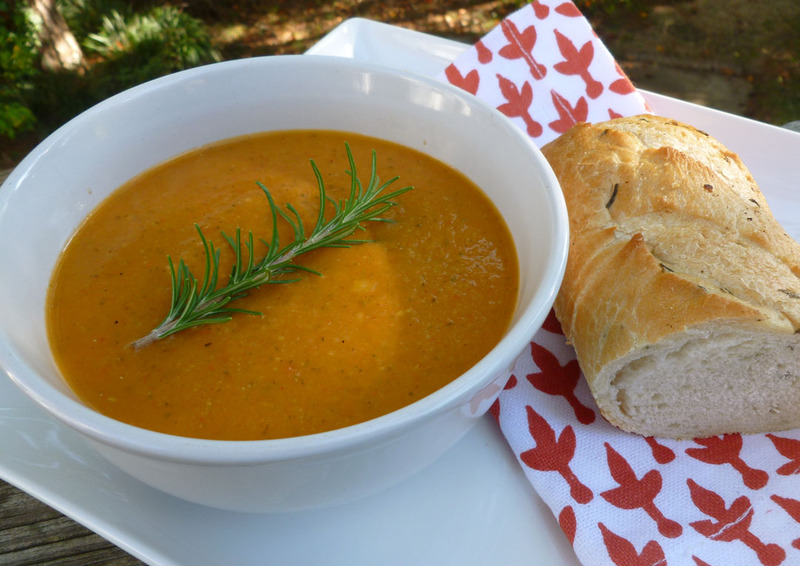 For yet another easy roasted soup, check out my Asian-Inspired Butternut Squash Soup, too. Add some crusty bread or corn muffins and a little salad, and dinner is…on! 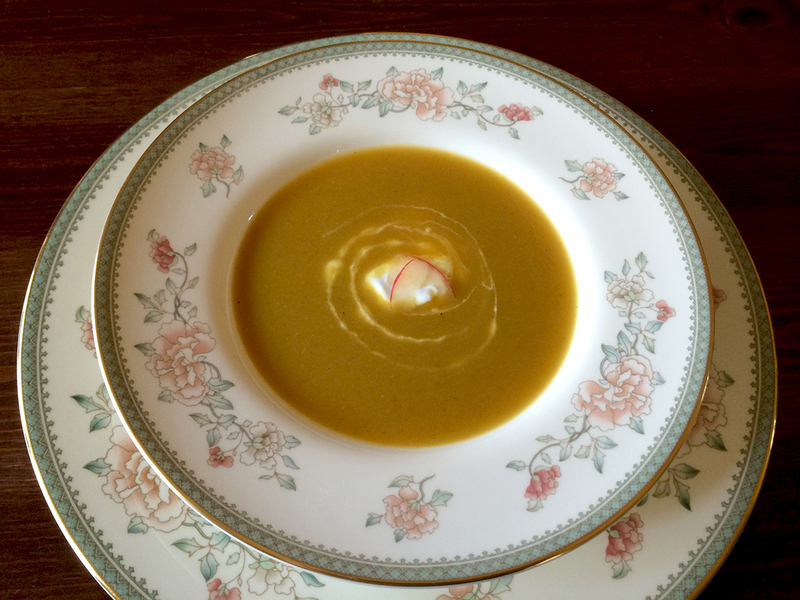 I’d like to take a moment to give a little shout out to blog friend Tanya of Chica Andaluza, whose last two posts provided some inspiration for this post (I love when that happens), turning my thoughts to roasting the veggies to make this soup. And on another note, my Facebook page is soooo lonely out there…it’s kind of sad. If you haven’t yet, please join me there for more shared food, photos, tidbits and good links by clicking this link or the one on the home page of this blog and “like” me! 1/2 teaspoon Kosher salt and 1/4 teaspoon freshly ground black pepper, and more to taste if needed when the soup is finished. Preheat the oven to 400 degrees F. Place all of the prepared vegetables (tomatoes, through peppers) and the garlic into either a deep non-stick roasting pan or a cookie sheet with sides that has been covered in aluminum foil. Pour the olive oil over the vegetables and toss to coat. Add 1/4 teaspoon black pepper, 1/2 teaspoon salt and the rosemary to the vegetables and toss again. Roast the vegetables in the oven for about 40-45 minutes, stirring every 10-15 minutes, until the cherry tomatoes have burst and the veggies are tender and just beginning to color. Remove from the oven. Pour the vegetables and their juices into a large stock or soup pot. Add the chicken broth, water, basil, oregano, remaining 1/2 teaspoon salt and 1/4 teaspoon pepper, and bring to a simmer over medium high heat, then reduce the heat to low and continue to simmer for about 15-20 minutes. Remove the soup from the heat and puree the soup carefully in the pot with a stick blender, or in batches in a regular blender, returning the soup to the pot once pureed. Place the soup back on the heat just long enough to heat it through, and taste for seasonings. Serve with crusty bread. 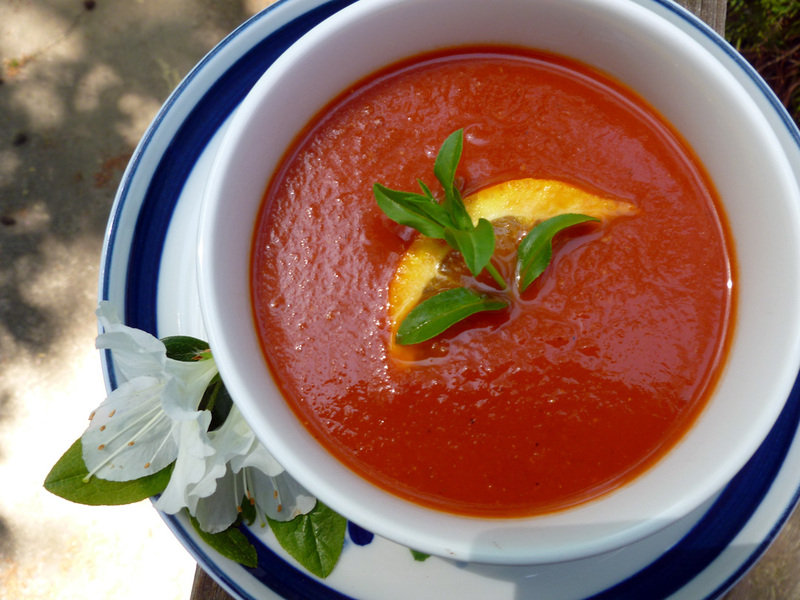 The soup is such a beautiful color from all the veggies and I love the little flecks of herbs and pepper.